Loose stool 하루 3회. Pitting edema. PPI 장기 사용이 SIBO의 위험인자인가는 controversial함. Duodenal aspirates로 분석한 최근 연구에서는 positive relationship을 보여주었음 (Franco. 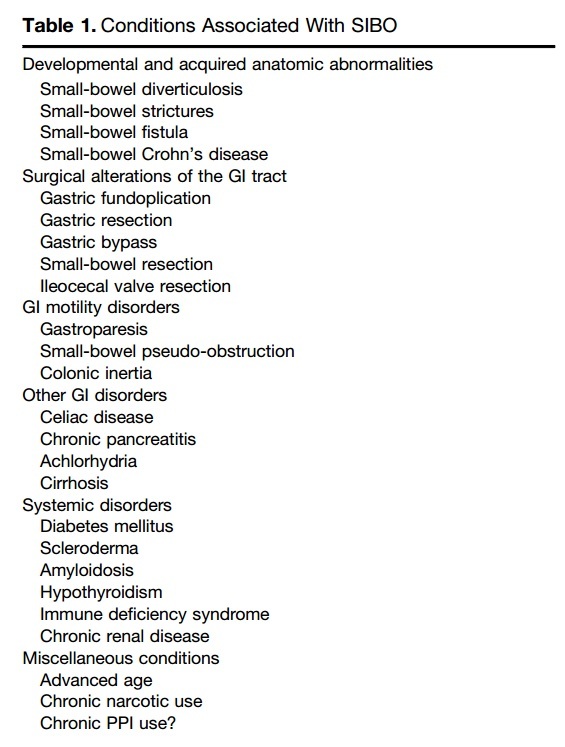 Gastroenterol Res Pract 2015). 2013년 메타분석에서는 "PPI use statstically was associated with SIBO risk, but only when the diagnosis was made by a highly accurate test (duodenal or jejunal aspirate culture)"라고 결론을 맺고 있음 (Lo WK. Clin Gastroenterol Hepatol 2013). SIBO 진단에 대한 gold standard가 없다는 문제를 잊지 말아야 합니다. Breath test에서 나왔다고 그대로 믿으면 안 되고 앞뒤 정황을 잘 살펴보아야 합니다. 함기백 교수님 comment: PPI가 intestinal permeability에 영향을 줄 수 있습니다. 김상균 교수님 comment: 오래 전에 subtotal gastrectomy를 받은 분입니다. A loop에 의한 SIBO일 가능성이 있다고 생각됩니다. 2016년 7월 11일 헬리코박터학회 집담회에서 오래 전 위암으로 subtotal gastrectomy를 받았고 PPI를 쓰던 환자가 설사와 체중감소로 내원하여 SIBO(small intestinal bacterial overgrowth)로 진단받고 항생제 사용 후 호전된 증례가 있었습니다 (증례 보기). 당시 SIBO의 원인이 PPI일지 수술에 따른 A-loop syndrome일지 논란이 있었습니다. 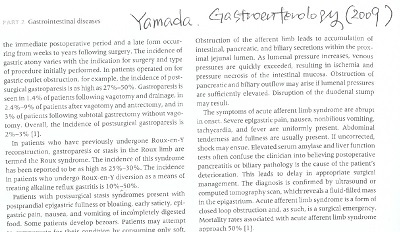 Yamada 교과서에서 subtotal gastrectomy 후 A-loop syndrome을 설명한 부분을 옮기니 참고하시기 바랍니다. 5 kg 체중감소와 구토. 고령으로 인하여 수술은 하지 않았고 left decubitus, soft diet 등으로 호전. 영상의학과 교수님 comment: UGI series에서 바륨이 끊겨보이는 것은 vessel에 의하여 눌린 것 이외에서 osteophyte 등에 의해서 눌려서 비슷하게 보일 수 있으므로 SMA syndrome에 diagnostic하지 않습니다. 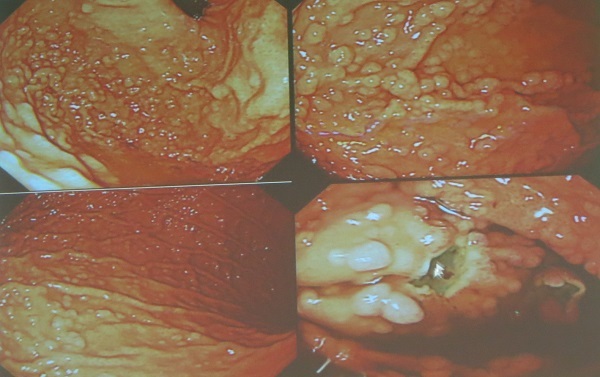 HCMP를 가지 환자였고 robotic subtotal gastrectomy with B-I 수술 후 복통과 발열. 수술 7일 CT에서 anastomosis site leak가 확인됨. Anastomosis site의 leakage hole에 대하여 clipping 후 fibrin glue apply하였으나 leak 지속되어 PGA (poly plycolic acid) sheet apply하고 hemoclipping으로 고정함. 아스피린 사용환자에서 anemia와 melena가 있었음. L-tube irrigation에서 oozing이 확인되었음. CT에서 ulcer perforation with panperitonitis. 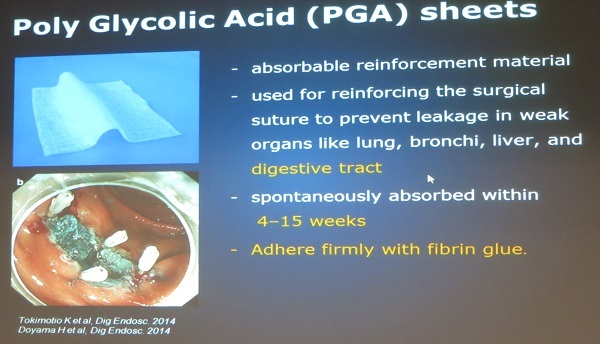 수술을 거부하였고 ICU에서 PGA sheet 및 fibrin glue apply하였음. 정훈용 선생님 comment: 두 case 모두 호전되고 있는 상황에서 PGA 시술이 된 상황이므로 악화되고 있는 경우에도 도움이 될 것인지는 명확하지 않습니다. Free preforation에서 천공의 치료로는 효과가 없고, 어느 정도 healing 되는 과정에서 치유를 facilitation 하는 정도의 효과가 있을 것으로 생각됩니다. 이준행 comment: 출혈성 궤양 환자가 천공을 동반하고 있는 경우는 매우 드뭅니다. 상부위장관 출혈 환자에서 nasogastric tube는 하지 않는 것이 좋습니다. Nasogastric tube irrigation은 오랜 관례이지만 효과가 없는 것으로 알려진지 오래이고, 현재 대부분의 병원에서 시행하지 않고 있습니다. Neoveil (absorbable polyglycolic acid felt)을 이용하여 천공을 막기도 합니다. 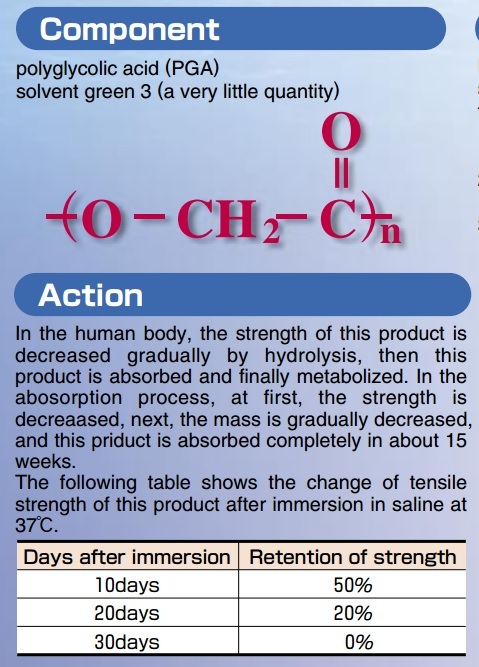 NEOVEIL is an absorbable reinforcement material made from PGA, and has the following characteristics. 1. NEOVEIL is a soft non woven fabric with elasticity through a special process. 2. 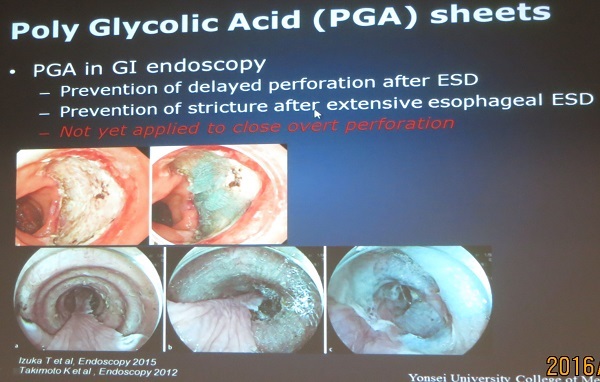 NEOVEIL is absorbed for about 15 weeks like an absorbable PGA suture material. So its advantages are for use to regions which do not take a long time to heal. 3. NEOVEIL has good biocompatibility since it is made from PGA that is used in many clinical cases as a suture. 4. NEOVEIL is colored with green dyestuff, therefore it is easy to distinguish between NEOVEIL and tissues in clinical use. 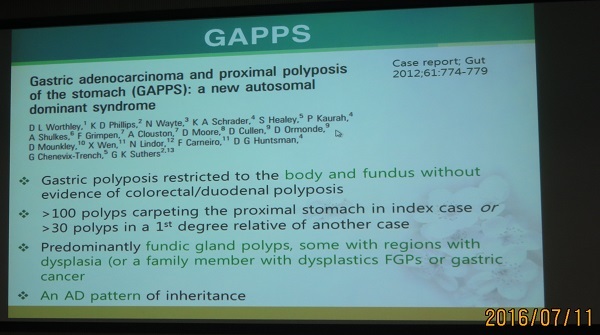 위암의 가족력이 강한 젊은 환자에서 fundic gland polyposis가 있었음. Rectum에 용종하나 있었으나 조직검사는 chronic inflammation이었음. PPI 사용 병력이 없었음.